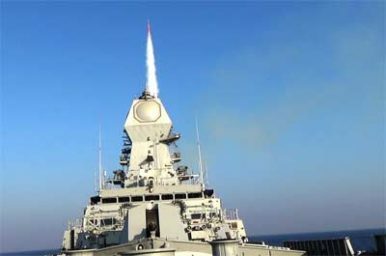 The Indian government has awarded Israeli defense firm Israel Aerospace Industries (IAI) an additional $770 million contract to supply Barak 8 long-range surface-to-air missile systems (LRSAM), also referred to as Barak LR, to seven surface combatants of the Indian Navy, the company announced in an October 24 statement. The contract was concluded with IAI’s local partner, Indian state-owned aerospace and defense company Bharat Electronics Limited (BEL), which in turn was awarded a $1.28 billion contract from Indian shipyards Mazagaon Dock Shipbuilder Limited (MDL) and Garden Reach Shipbuilders and Engineers (GRSE) to deliver the seven Barak 8 LR-SAM air and missile systems to the Indian Navy in September 2017. The October 24 contract was preceded by the conclusion of a $630 million deal, signed in May 2017 between IAI and BEL, for the supply of four Barak 8 LR-SAM systems to the Indian Navy. In April 2017, IAI and BEL also signed a $2 billion deal for, the medium-range surface-to-air (MRSAM) missile defense systems, the land-based variant of the Barak 8, to the Indian Army. The Barak 8 LR-SAM air and missile defense system will be installed aboard Visakhapatnam-class guided missile destroyers, Kolkata-class destroyers, Kamorta-class anti-submarine warfare corvettes, and Project 17A class of stealth frigates, as well as on the INS Vikrant, the service’s first indigenously built aircraft carrier. The Barak 8 LR-SAM missile defense system has been jointly developed by IAI and India’s state-owned Defense Research and Development Organization (DRDO) in collaboration with defense contractors in India and Israel, including Rafael Advanced Defense Systems. The two countries began join work on the LR-SAM in 2006 with a first successful test firing of the missile system taking place in May 2010. LR-SAM also features a multifunction active electronically scanned array naval radar system providing 360 degree coverage. The Barak 8 LR-SAM was last test fired by the Indian Navy from the 7,500-ton Kolkata-class (Project 15A) guided-missile destroyer INS Kochi in November 2017. With the recently signed contract, the sales of the jointly developed Barak 8 over the past few years total over $6 billion, according to IAI. Bharat Electronics Limited announced on September 5 that is has been awarded a contract to supply seven missile defense systems to the Indian Navy.